Holiday Salad with Vanilla Vinaigrette – Just 4 Carbs! Squashabilities! Salad, Entree, Dessert = 5 net carbs! 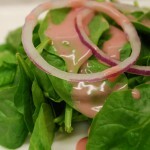 0 Carb Salad Vinaigrette – Woo Hoo!!! Caesar Salad – Bring Fine Dining Home with this “Can-Can” Salad!